It's no secret that Pinterest is one of my favorite things ever. I'll never forget the day my friend referred me. Back then, it was invite only. I waited not-so-patiently for her referral to finally get me an invitation. I had been ripping beautiful room photos out of magazines and saving five million internet pages to my bookmarks folder for years. After joining Pinterest, I forgot about those days within a matter of minutes. Now I could have an online pin board for every room in my home to keep all of those inspiring images organized! But if you spend as much time on Pinterest as I do (both as an individual and as part of my job as a blogger), you start to see the same images over and over again. It starts to become hard to find new inspiration online. Lately, I've been going back to basics. I still love Pinterest of course, but I've been pulling out some of my old home decor magazines and interior design books to give me fresh vision. I could sit for hours looking at a home decor book.. even if I've already read it ten times. I always notice something new in the photos depending on what project I currently have on my mind. Because of my new habit of going to books and magazines for inspiration, I've started adding some new home decor books to my collection. The best part about it is that they double as home decor! These books all have inspiring images but are also beautiful on the outside. They can be styled on a shelf or a coffee table. 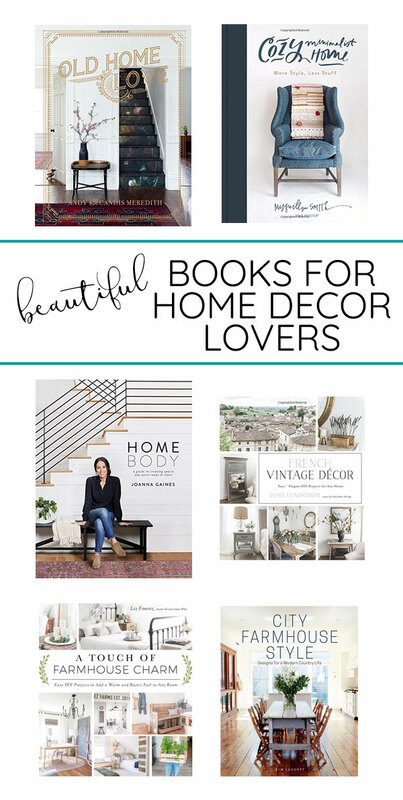 If you're looking for a gift idea for a home decor lover or you are just looking for some new inspiration yourself, these books are gorgeous and sure to inspire! For more decorating and home improvement book ideas, head over to my Amazon page!